Yep, this is a level in which the creator turned Mario’s glorious star into a player’s worst nightmare. It’s early days for Super Mario Maker, which means people are still figuring out what makes a Mario stage tick. It’ll take time before we see what people are truly capable of, but I’m already impressed by some of the cleverness on display. In this case, it’s a Japanese creator flipping the script on a Mario star. 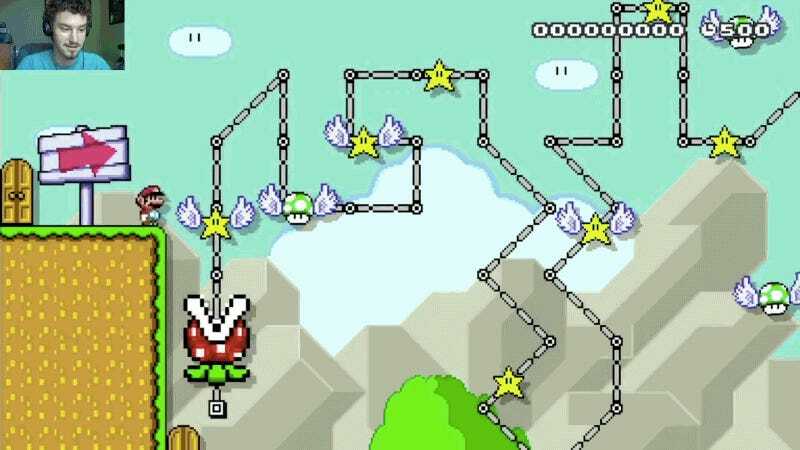 In an ordinary Mario level, whenever a star appears, you’re off to the races, hoping to grab the item that gives you an opportunity plow through everything in your path. By design, stars are meant to give players a break and feel all-powerful. When bopping most enemies, you bounce off them—enemies are basically platforms. Most are killed with a single pounce, while others let you stick around indefinitely. In star mode, however, you fall through the enemies. This level takes advantage of this catch. I wasn’t sure how to approach it, but there were a few options. When you don’t press anything, Mario slowly hovers above the piranha plant, but since he’s bouncing so quickly, it’s difficult to maintain control. The other option is to bounce with all of your might, letting you potentially dodge from objects, but with less room for error. You’re at the mercy of the piranha getting away from you, overcompensate the landing, and hitting a star. I’ve booted up other Super Mario Maker stages and immediately concluded I’ll never beat them. I’m up for a ridiculous challenge, but what’s great about this stage is how it immediately seems achievable—you need to focus on the pattern. If you have somehow beaten this—ECA4-0000-0035-DD8F—please tell me how. Key to an overwhelming challenge is feeling as though it’s possible. Death may be fast, furious, and constant, but if there’s an “aw, schucks” quality accompanying it, creating a light at the end of the tunnel, you’ll keep playing. Without much effort, it’s possible to make it through half this stage, an illusion of accomplishment. The second half is where the challenge lies, but the illusion is enough to function as a carrot, keeping me coming back, death after death. Over time, I began to slowly piece together what to do, section by section. Small bounces to put Mario into the right position. Carefully leap over the first star—let it glide underneath you. More small bounces until, as with the first part, a careful leap. Hug the right side of the piranha to avoid the next star entirely. The frustration here is apparent, but I was also playing it up for the camera. What I really felt in that moment was elation; the goal had become achievable, and I was capable of making it through most of the level without any errors. I’ve experienced similar tensions while going for the final hit on a Dark Souls boss or waltzing through Hell in Spelunky. When you’re so close to that thing you’ve been working towards, it becomes so easy to mess it up. Even though you possess all the skills necessary to finish it off, it’s easy to be blinded and fail. 6. Hang in the middle, avoiding the stars you just successfully avoided exacting last-minute revenge, and leap over the final star. 7. Stay calm, it’s all over. Finally. My hands were trembling as the screen went dark, which has never happened to me while playing a Mario game before. This is something new, and it’s what’ll keep me coming back to Super Mario Maker in the weeks ahead. Check out this stage yourself by tapping in 8F2C-0000-0028-E825. Good luck! If you’d like to watch me fumble through more stages like this for 30 minutes every morning, hit up my Twitch channel at 9:30 am EST.